The space is lighting up and after liquidation of Feb 24, XRP experienced the “CoinBase Effect”. The result is a temporary surge of XRP prices thanks to announcement that the US Based crypto exchange CoinBase will finally allow their CoinBase Pro customers to trade XRP. 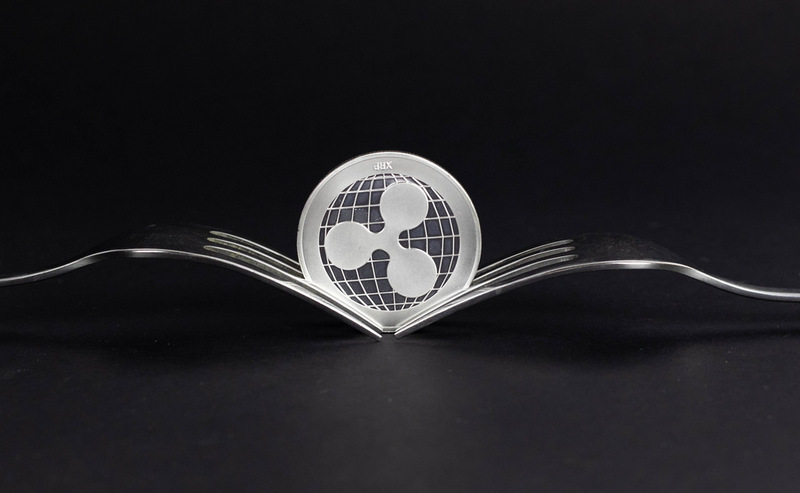 In lock-steps, CoinBase will open the doors for XRP order placing and it is no doubt a direct boost for XRP, the world’s third most valuable digital asset marred with regulatory challenges. As part of their digital asset regulatory framework, CoinBase is very stringent on what kind of asset it avails to their customers. While they have been ramping up support listing Ox—which many said was a security—and lambasted for their by-passing other stable and high liquid assets as XLM and XRP for example, the exchange does emphasis on local law compliance. Therefore, despite SEC lack of commitment and failure to, it is increasingly becoming clear that XRP is after all a decentralized and independent ledger, a utility that can function without Ripple Inc. Whether this move is a precursor of what lies ahead and that might force the US regulator to clarify their position on XRP allowing businesses and financial institution to flow to xRapid, we are not yet sure but what we do know is that XRP is vibrant now and after the initial shakeout, odds are an inevitable price and market cap expansion is on the cards. Evidently, Ripple (XRP) is the top performer in the top 10 and is up 5.2 percent in the last 24 hours. 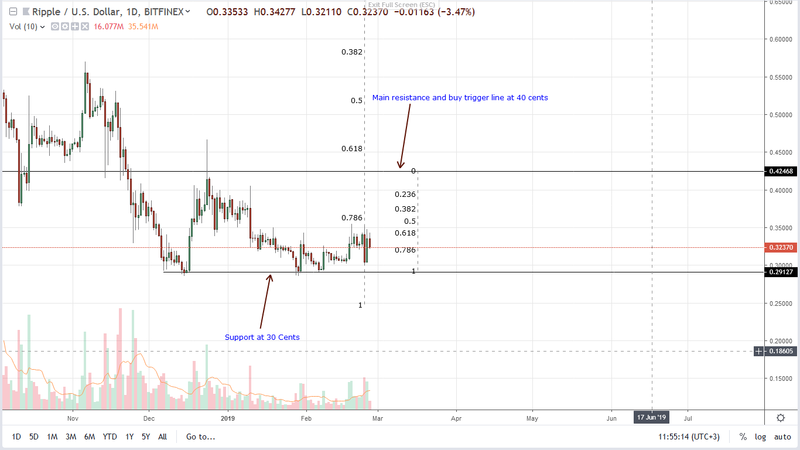 When we factor in the liquidation of Feb 24, we are convinced that is was a shakeout and because our trade plans are valid, every low will technically remain to be another spring board for buyers aiming at 60 cents and even 80 cents as laid out and emphasized in our last XRP/USD trade plans. Thanks to Feb 25 upswings, 30 cents is proving to be a solid foundation where traders can build on and race higher. Despite recent liquidation and the failure of bulls to race above 34 cents triggering our short-term buys at 34 cents, the failure of sellers to drive prices below 30 cents reaffirms our previous outlook that buyers are in control. Besides, it goes on to show that prices could snap back in trend and follow the route set in motion by Sep 2018 bulls which confirmed by buyers of mid-Dec 2018, late Jan and early Feb. Moving on, risk-off traders can take a neutral but bullish stand until after there are conclusive, high volume buys above 34 cents. Thereafter, like we have reiterated, first targets will be at 40 cents. After Jan 30 springs, market participation levels have been on the rise off 30 cents. Note that averages rose from 17 million to 34 million, doubling in just over 3.5 weeks. Even so, XRP bulls have been unsuccessful and their inability to break above 34 cents means prices are accumulating in readiness for a rally thanks to increasing volumes and higher lows and higher highs. Ideal volumes that should pump prices above 34 cents towards 60 cents should exceed 52 million of Feb 24 and of Jan 10—83 million. don’t understand. coinbase is not reliable exchange for the partnership so why ripple decided to join it….